The latest installment of the writer/director's Chronicles of Brooklyn series is a frustrating misfire. It’s summer in Brooklyn and tensions flare between the old guard and the new, until one man shatters the silence with a swift, shocking act. And all the while, Mookie delivers his pizzas. Because he’s got to get paid. That could be a plot synopsis for both Spike Lee’s Do the Right Thing (1989) and his new drama Red Hook Summer, which opens on Friday in New York. The former was an incendiary provocation that remains an iconic snapshot of ethnically disharmonious 1980s New York. The latter revisits many of the same core issues of race, gentrification, and tattered relationships, but without the zeitgeist-capturing edge that made Lee one of the most respected (and by some, reviled) filmmakers of his generation. Red Hook Summer tells the story of Flik Royale (Jules Brown), a sullen young teenager - is there any other kind? - spending a few weeks in Brooklyn with his grandfather, the pastor of the ironically named Lil’ Piece of Heaven Baptist church. When first we meet Flik he’s clutching his iPad for dear life, while his grandfather, Bishop Enoch Rouse (Clarke Peters), brandishes his Bible. Each is hiding behind their books, be they digital or analog, for entirely different reasons. Why Flik has been exiled from his life of middle-class comfort in Atlanta for a summer vacation in the projects is unclear. His mom (De’Adre Aziza) appears to barely tolerate her father, preferring to leave her son at his doorstep in the opening moments of the film, rather than enter the old man’s apartment. It’s a striking juxtaposition, for a man of faith so respected by his small but enthusiastic spiritual community to be disdained by his daughter, and that narrative disconnect haunts the film until a sad truth is revealed. As the summer progresses, Flik meets Chazz Morningstar (Toni Lysaith), the churchgoing young daughter of one of the parishioners. They two form a close bond, as they push the boundaries of Red Hook and impending adulthood. Surrounding them, as in most Spike Lee films, is a colorful cast of supporting characters, including Lee himself (briefly) as Mookie, the pizza deliveryman from Do the Right Thing and Tracy Camilla Johns (also briefly) reprising her titular role from Lee’s She’s Gotta Have It (1986). Red Hook Summer is a confounding film. Working with an obviously scaled back production model, Lee’s goals are clearly modest - to tell a small story with a cast comprised mostly of unknowns. But the actors just aren’t very good. The whole enterprise has the look and feel of a (slightly) above average student film. She’s Gotta Have It had a similarly stagey (at times) indie charm, but it was clearly the work of a visual stylist. Lee’s direction here is so haphazard that I can only guess it was intentional, to prove some sort of point that I didn’t get. The most believable performance in the film is delivered by 14-year-old Toni Lysaith, a young actress with a charming screen presence. But she and her young co-star (Jules Brown) are forced to deliver clunky lines that sound nothing like teenagers talk in 2012, or likely any other year. Again, I can only guess that Lee (who also wrote the script) was endeavoring to craft a certain unreality into the writing, in an effort to make the story more timeless/allegorical. Many of the films Lee has scripted have passages that sound written but, in the hands of talented actors, they transcend the un-reality and become memorably larger-than-life. There is no such talent on display here, at least in front of the camera. No lead perfromance in this film is particularly believable, and the premise suffers from one huge question that is never answered - why has this kid been sent to Red Hook to live with this man? If you want to see a powerfully emotional film about young people of color coming of age in Brooklyn, seek out Dee Rees' Pariah, a film that should be much better known than it actually is. But if you do see Red Hook Summer make sure you stay for the credits. With a fun mix of music and grainy 8 mm film, Lee finally delivers the visual style I spent two hours waiting for. Unfortunately it came too late. But at least we know Mookie and Sal patched things up. 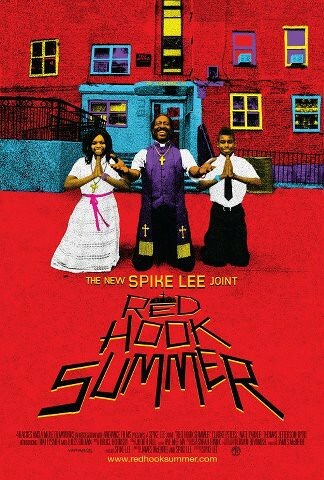 Red Hook Summer opens nationwide August 24.